Our last meeting with Murcia French. So far we’ve been sharing with you all the joys of serving in Spain, the great sights and welcoming friends. Of course it’s been a great experience so far, but to be fair we should share both sides of the coin. Especially if any of you are thinking of doing something similar in the future it’s good to have a realistic view of things. I hope that it will actually be encouraging to see how obstacles can be overcome with Jehovah’s help and a sound mind. We have been here almost three months and have encountered many challenges, some small inconveniences others seemingly impossible obstacles. This last month has been one full of stress actually, there were moments where it was almost paralyzing. What happened you say? Well one thing is that I was laid off from my job. This was one of the ways we had planned to support ourselves. Second is that Antoine was then offered a great paying job but had to refuse because it conflicted with the meetings. Of course there was never a question to take a job missing meetings, but the timing just added to the anxiety. Third cause of stress, my visa expiration is coming up and dealing with the Spanish administration was becoming a mountain of a problem. You see we needed to get residency so that I can stay in Spain. According to all the laws of the country this should have been an easy process being that Antoine is a European citizen. How can I explain … We have been to the Foreigners Office (Immigration Office) every week this month, some weeks more than once. Each time we are told different things, even by the same people. It’s very frustrating. Anyways it came down to Antoine needing a job that would enroll him in the social security system here in Spain and his current job was not able to do this. Time was ticking…we now needed another job that fulfilled the requirements for residency and more money. We had a decision to make before Jan 1st. Go home to Cali and start life over or find a job in a few days that fit the needs (in a country with crazy high unemployment). The odds seemed to be stacked against us. We had tried everything but nothing seemed to be working! Needless to say we were sad, frustrated, even a bit depressed. We struggled to keep going with our schedule, with so much on our minds it’s been hard to think of service and even being with the friends. But as you’ve read each time we pushed ourselves we had good experiences in the ministry and were encouraged by the friends. We definitely have much more sympathy for immigrants in the territory. The more we went out the more we felt Jehovah’s blessing on the ministry it just didn’t seem to be transferring to our personal circumstances. We just continued praying for direction and looking for solutions with the help of friends who were generous with their time, bringing us back and forth, here and there. In the end we realized this week that we had done all we could and we were just grateful for the experience these last three months. A sister brought us once again to the foreigners office and we spoke to the inspector who gave us two options but in reality only one was possible: find another job for Antoine. My visa expires in 10 days. The country is on leave because of the holidays. Obstacles mounted high against us! This is just not going to work it seemed! We wanted to be reasonable and act responsibly by knowing when to pull out and be grateful for all that we’ve experienced. But we also knew that up to now Jehovah has wiped out some seemingly wall like obstacles right before our eyes after we had taken steps to show him that we had faith that he could do it. I don’t want to under emphasize the importance of taking steps or action to show that we have faith. You might remember the post entitled ‘We Made It’. This showed clearly beyond a doubt how things that we might perceive as impossible can be accomplished with faith and confidence in Jehovah. So how could we show this same type of faith in Jehovah in our current situation. Well we knew that we had to give Jehovah time to act in the way that he deemed fit if he so desired instead of in the way that we might like things to be done. So in this situation that meant waiting just a little while longer before making a decision to leave Spain for home or for another country. This is easier said than done. Because when you are in the middle of a situation that seems rather bleak from a human standpoint and you are the one that is primarily affected by whatever decisions you make it is much easier to act according to what we think is possible. But we decided to allow some more time and see if Jehovah would bless our efforts to allow us to continue serving in a foreign land. Friday morning Antoine received a call from a company. Thirty minutes later a Skype interview was conducted. A job offer was made and accepted. All this took literally under 24 hours! We literally were speechless after we realized that we had just got a job so quickly. We started dancing around the apartment afterwards (although neither of us are very good.) Examining the circumstances and the odds not in our favor we can only attribute this to Jehovah. We are grateful to Jehovah for allowing us to continue serving him in a foreign country where the need is great! So dear friends and family, it looks like we will be moving!!! Where are you moving you might ask?!? Well let’s just say we’re incredibly excited but also very sad to be leaving our lovely friends and the territory in Murcia! It is truly bittersweet! We feel like we did leaving Mill Valley all over again. We have truly grown attached to Murcia. It is with sad hearts that we leave our new friends that we have made. It is truly amazing how attached you can become to people and a place in only a few short months. On Saturday we said good bye to our studies Jean and Samba. Even though we have only studied a few times these ones are dear to us. It was sad at the end of the study when we broke the news for all four of us. We all were teary eyed. Today Antoine went to visit the studies again with a brother named Jose Forano who will be continuing the studies. He is a Spanish brother who has served in France and Spain, went to MTS and has many years experience as a pioneer and a need greater. We feel that Jehovah will truly bless him as he continues to help Jean and Samba draw close to Jehovah. He has a calm demeanor and is extremely patient which will prove to be vital with these studies. He also will really appreciate these studies and will work hard to help them. If your reading this Brother Forano, Muchas Gracias por su ayuda y que Jehová bendecirá sus esfuerzos mi amigo! 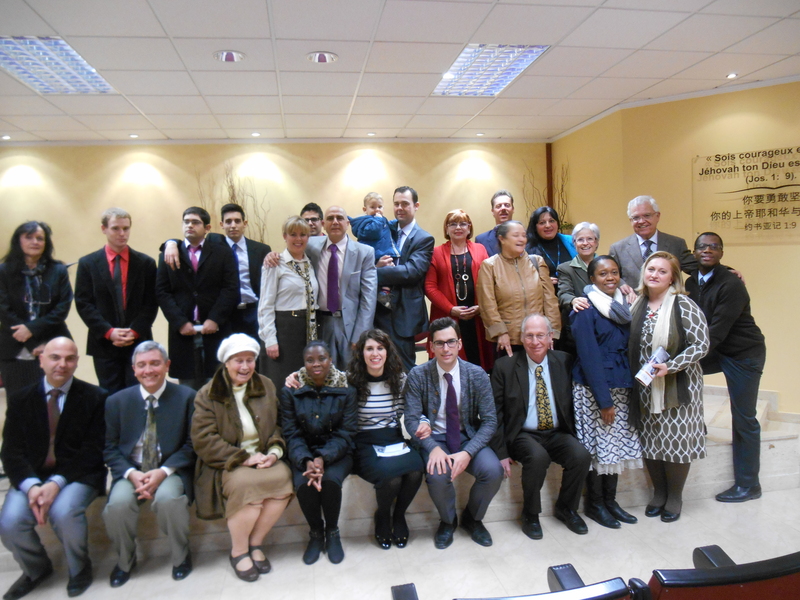 Saturday night was our last meeting with only the Murcia French group. We were kinda feeling sad about it throughout the day because we knew that we would have to break the news to some good friends. Many of the friends took the news well and understood that it was not because we wanted to leave that we were going. We really hope that we were an encouragement to the group and that they continue serving Jehovah in there territory and that it bears much fruit! For the public talk we had a Special Pioneer brother from the UK who is currently serving in Torrevieja with his wife. It was neat to hear someone speaking French with an “English” accent. I felt like I was back home again. After we told the brother where we were going he told us that he knows that there is much need there. Previous PostAmazing study with Jean and Samba!